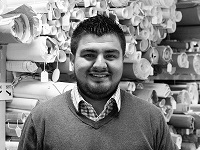 Victor joined BRS Architects in August of 2014 after receiving his Master degree in Architecture from the University of Idaho. You can find Victor working on a wide range of project types including educational, government, and commercial. Victor assists with modeling, drafting, preparing documents for construction, and the construction administration process as well. He continues to grow and develop as a designer with the goal to acquire his architectural license in the near future. When Victor is not busy at the office, you can find him playing soccer, traveling, and enjoying the Boise nightlife.